The epistles, written by Paul and others, teach us many things about being a Christian, and how to live every day. OT ALL THE letters, or epistles, that we find in the New Testament were written by Paul. Two were written by Peter, three by John, the beloved disciple of Jesus, one by James, and one by Jude. 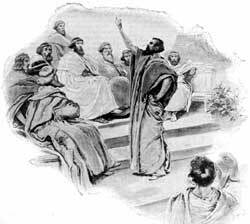 In these epistles we learn about the teachings of the preachers in the early church. We learn how they depended on God to help them teach rightly. And we learn that their letters were intended to be read, not only by those to whom they were written, but by all who hear the word of God even today. Many parts of the gospel which are not explained in the stories of Jesus are told clearly in these letters. Here we learn that all people are sinners who have been born into the world since Adam and Even sinned against God. We learn that every one deserves to be punished for his sins, but because God loves sinners he planned a way to save them from punishment. He gave his only Son, Jesus, to be punished in their stead, that every guilty sinner might go free from punishment. But we learn also that every sinner will be saved from punishment. Only those who believe that Jesus died for their sins will be saved. Those who refuse to believe in Jesus will die in their sins. For it is by believing in Jesus that his blood washes away the stains which sin has made on the souls of men and women. And those who do not believe can not have the stains of their sins washed away. Another thing these epistles, or letter, teach us is how Christians live. We learn in them that Christians are honest, good to the poor, willing to suffer for Jesus' sake, kind to those who treat them wrongly, always ready to forgive their enemies, and that they love one another, and try to lead others to Christ. We learn that Christians are a happy people; for God gives them joy that sinners know nothing about. This joy comes into their hearts when they believe that Jesus washes away their sins with his blood. Sinners do not believe this, and they can not understand the Christian's joy. Always they fell guilty before God and afraid to die. We learn in these epistles that some day Jesus is coming again. When he comes he will take with him all those who believe in him, and they shall dwell with him forever. In that day all who are lying in their graves asleep in death will waken, for a great trumpet will blow which will be heard in every part of the world. And those who died believing in Jesus will rise to meet him in the clouds of the sky. Those who did not believe in Jesus will cry out in fear when they rise from their graves. They will try to hide from the Lord, but nowhere shall they find a place. These epistle tell us that no one shall know when the last day will come, for it will come like a thief comes in the night. Just as Jesus warned his disciples to watch and be ready, so the epistles tell us to look for the coming of the Lord. Although many years have passed since these letters were written, we know their words are true. They tell us about things that are happening now. They say that men in the last days will not believe Jesus is coming again, and that they will scoff at those who try to please God. And we find many people in the world today who do not believe in Jesus, and who make fun of the true religion. Such people do not believe that God will destroy this world with fire, just as the people who lived before the great flood did not believe Noah's words when he warned them about the rain that would come on the earth. But God sent the rain, and God will send the fire, which will destroy this world and everything in it. No wicked person will be able to hide from God, for every hiding-place will be burned up. The epistles also tell us much about God the Father, and God the Son, and God the Holy Spirit. These three are not three different Gods, but they are all one God. We can not understand how this is true, yet it is true. If we worship God the Father we must believe in God the Son and also in God the Holy Spirit. It is God the Holy Spirit who causes the sinner to feel that he should quit his wrong-doing and ask Jesus to forgive his sins. It is God the Holy Spirit who comes into the Christian's heart to dwell. And when we pray, whether we call on the name of the Father or on the name of his Son or on the name of the Holy Spirit, we are praying to the same God, and the same God will hear and answer our prayers.